The visit included stays at the Atlantis, Peppermill, Eldorado and Grand Sierra Resorts; all four star, full-service properties. Best of all, I played in each poker room’s daily no-limit hold ’em tournament. My first scheduled game was at the Atlantis. The poker room manager is Keith Dames, a poker aficionado who also writes a gaming column. The setting is comfortable, with tableside dining and a self-service soup and beverage bar. I managed a 7th place finish and headed to the Manhattan Deli to celebrate with a giant sandwich that was equal to anything served in New York City. I finished the afternoon with a relaxing massage at its fabulous, award-winning spa. Later, I dined at the Atlantis Steakhouse, which was recently voted the Best Overall Steakhouse in the Reno-Tahoe area. The next day I was off to the Peppermill for breakfast at Biscotti’s, then the noon tournament. 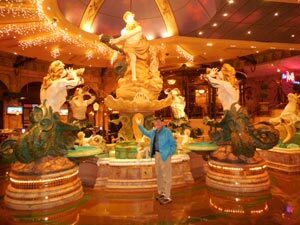 “Poker Digest” rated the Peppermill’s poker room one of the “Top 25 in the USA.” Mike Nelson runs the show. There is a self-service soup and beverage bar for players. I had another final table finish (7th). “The outcome of a hand is not indicative of how you played,” Nelson reassured me. One can play well and still lose. That evening, the Four Diamond Bimini Steakhouse lived up to its reputation — great drinks and top quality beef. On the move again, I had breakfast at the Eldorado’s classic diner, Millies24. The poker room is managed by Margie Heintz, who began her poker odyssey in Montana. Heintz holds a special place in gambling history as the first woman dealer at the World Series of Poker. She was inducted into the Women in Poker Hall of Fame in 2011. I played in the tournament and moved up a notch, finishing 6th. The Eldorado buffet offers extensive food and salad choices, but the BBQ station and gelato bar were my favorites. Later that evening, I enjoyed “Madame Houdini” in the showroom. Morning at the Grand Sierra Resort began with breakfast in the Grand Cafe, followed by a rejuvenating massage at their tranquil spa. Fed and relaxed, I headed to the tournament, where the affable circuit ring winner Charles Williams manages the poker room. There, I had my best finish of the week — 4th. Lunch was at the Cantina. Super margaritas and table-side guacamole rule here. Evening found me dining at the iconic Charlie Palmer restaurant, followed by cocktails and music at LEX, Grand Sierra’s high-energy nightclub. More than $50 million has been spent remodeling the resort, and it shows. Closing Thoughts: I’ve only skimmed the surface of what these resorts have to offer. There’s a huge range of casino action, restaurants, bars, clubs, convention/meeting space and leisure time activities. Regarding the tournaments — four final tables in four days — it was an amateur’s dream. 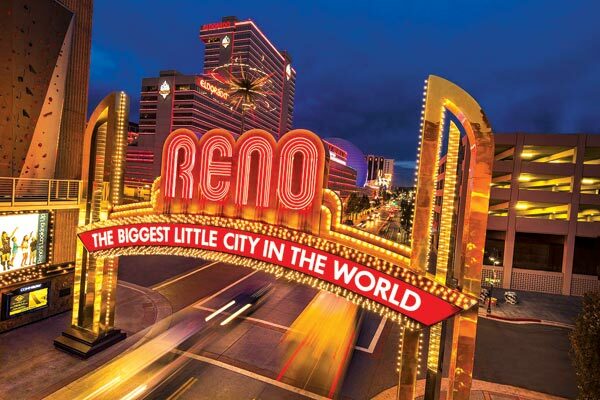 These resorts certainly deserve their title, “Four Aces in Reno.” For more information about them, go to www.PokerResortsReno.com. Coming soon: the Poker Resorts Reno app which will include four $10 coupons for various casino/resort discounts plus my “Poker Tutorial: Omaha 101.” Stay tuned!